Glenfern Valley Bushlands comprises 40 hectares or 100 acres, 35 km east of Melbourne. It is bounded on the south by Glenfern Road, on the west by New Road, the north boundary is Ferny Creek and the eastern boundary is 'Depot Track'. The land falls gently from south to north, with Grassy Forest and Herb Rich Foothill Forest on high ground to Riparian Forest at the creek line. It is in the Southern Fall Bioregion, and contains a large area of remnant vegetation. This land is now Crown Land under management by Department of Sustainability & Environment and the Shire of Yarra Ranges. It is being rehabilitated by Friends of Glenfern Valley Bushlands - a volunteer group of interested local people who weed and plant in the park on a monthly basis. This land is now used for passive recreation - walking, bird watching, etc. You can walk the 100 acres Reserve in a large loop, a figure eight or any way you wish, as there are several interlinking tracks. Which ever way you choose, you will find a variety of easy walks, different views, changing vegetation and a variety of wildlife. 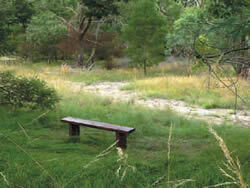 Glenfern Valley Bushlands is continually evolving in both nature and facilities. It has important conservation values and opportunities to provide for a range of recreation activities in pleasant natural settings. If you would like to picnic, there are two picnic tables along the Glenfern ridge track but you may choose one of the many quiet areas. Please take your rubbish with you. There are eleven seats, strategically placed to take in the various views and to rest in quiet surroundings. The Reserve is suitable for people of all ages, particularly local residents and school groups working on environmental projects. You may walk your dogs there but please remember that the Reserve is used for roosting and we do not want to scare off the wildlife. Some of the tracks are fairly steep and rutted and, until we can get these remade, the elderly should avoid them. There are other gentle walking tracks in the Reserve. We now have sign posts for the tracks and there are maps at the entrances. IIn 1867 James ‘Cranky’ Smith purchased 44 acres of land and in 1872 bought a further 73 acres , which is part of the current 'Glenfern Valley Bushlands'. It was owned briefly from 1898 to 1901 by William Ward whose property totalled 117 acres, encompassing the current Bushlands. In 1901, 97 acres was sold to Alfred McFarlane who still owned this land in 1958. The land was cleared and used as a dairy farm. There was a farmhouse on the corner of New Road and Glenfern Road, the only remaining evidence of this are some fruit trees (Prunus spp), roses (Rosaceae) and Hawthorn (Crataegus monogyna), which are naturalised over the property. Investigation is continuing to find out who owned the land after the McFarlane Family passed away. The only information available is that the last remaining family member left his money to the Angliss Hospital, but it is difficult to find out who became the owner of the land at that time. From around 1977 to 1987, the land was owned by Albion (Boral) Quarries. Rock was quarried on site for only a short time due to complaints from neighboring properties, about noise and house damage from blasting. 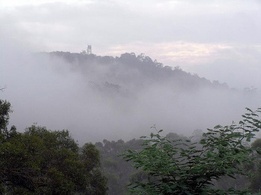 The land was then handed to the Victorian Government in a land swap, to eliminate quarrying from the Dandenongs. The result was to bring about a land swap with another site in Lysterfield (Wellington Road). During the time that this land was untended, it was used by 4 wheel drives and trail bikes for ‘recreation’ and consequently the area was badly eroded with deep culverts from these vehicles. Local people had also used the area as a convenient rubbish dump for several years, and many tons of rubbish and car bodies have been removed from the site over the past 5 years. The area was in extremely poor condition in 2000 when a group of interested people got together to have this land preserved and rehabilitated. Many hundreds of hours of both volunteer and council contractor time has gone into the works to date, which have seen spraying of Chrysanthemoides monolifera (Boneseed) and Rubus fruitcosus (Blackberry) that are prolific on the site. Reservation of the land recognised with an opening ceremony by the Minister for Environment, the Honourable Mary Delahunty in April 2004. Preparation of a Management Plan and a Fire Management Plan. Regular monthly working bees, attended by 12-15 people on average; we have cleared about 20-25 hectares of Boneseed and Sweet Pittosporum. Planting thousands of indigenous trees, shrubs and grasses. 68 cubic metres of rubbish, more than 25 car bodies and many large pine trees removed. A fence to control vehicle access. Fauna surveys show >80 bird species including the Powerful Owl and many migratory visitors. New animals are recorded as seen eg Common Long-necked Tortoise, Koala in the last year. Flora lists for the site are established and include at least 15 regionally significant flora species and one state significant Ecological Vegetation Community in Valley Grassy Forest. Melbourne Water grants for weed control and removal along Ferny Creek. 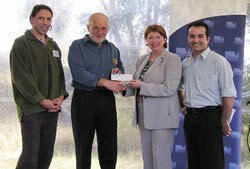 Caring for Our Country grant for woody weed removal and indigenous revegetation. Main car park and entrance upgrade. Yarra Ranges Council Community Cultural grant to recognize the significance of the Reserve to indigenous people. Caring for Our Country grant for weed suppression and development of the quarry as an environmental, educational destination. Click here for the walking track map PDF. Click here for the location map PDF. Click here to view the Management Plan. Click here for the flora list. Click here for the fauna list. and Yarra Ranges Plant Directory.